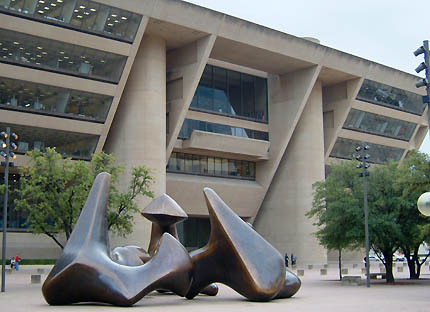 "When you do a city hall, it has to convey an image of the people, and this had to represent the people of Dallas... The people I met - rich and poor, powerful and not so powerful - were all very proud of their city. The felt that Dallas was the greatest city there was, and I could not disappoint them." Pei's design involves a dramatic cantilevered facade, facing north towards the newly growing office towers of Dallas, "to create a dialogue with the downtown, a public-private dialogue with the commercial high rises." To effect this dialogue meant extending the site to transform seven acres of rundown buildings into a new plaza for the building to look out onto, together with a newly built "buffer zone." The basis for the facade is partly sculptural, allowing the relatively low-rise building to "assert" its presence with respect to the cluster of high-rise office towers. 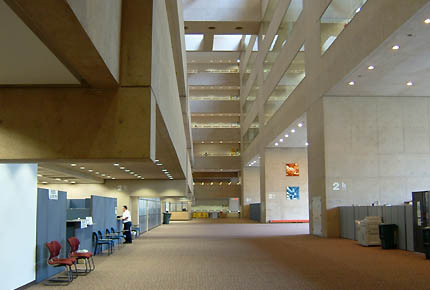 Pei also hoped that by creating the bulk of the office space for officials in the upper stories, citizens could visit the lower stories without having to navigate through an off-putting number of offices and people - an interesting opposite to Foster's more recent approach to London's City Hall and Berlin's Reichstag, which both involve bringing the people up above their representatives. In practice, the result is a set of generous and attractive public spaces on the lower floors, with excellent downtown views, which are if anything too empty. They feel as if they would be better filled by theater-goers milling in the interval than by lone individuals wandering in to pay their parking fines. 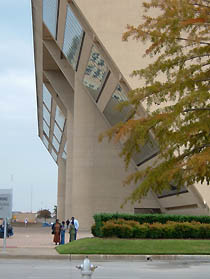 The City Hall is on the south edge of downtown, just north of the I-30. Depending on your driving direction, take Griffin St, Akard or Ervay exits. City Hall is best approached from Young St, which runs along the north edge of its plaza. Click for more detailed directions from the City Hall web site. 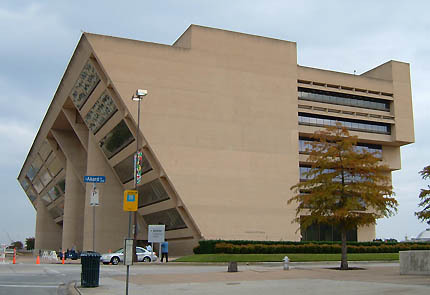 Dallas City Hall is open to the public. 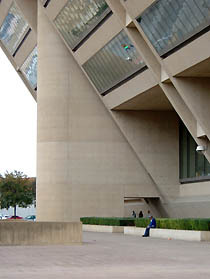 Its web site is at www.dallascityhall.com, but is particularly uninformative about visiting. Highly readable and with great photography, this biographical account focuses in depth on a number of I.M. Pei buildings including this one. Further information and pictures for this building are available at the website of Pei Cobb Freed and Partners.